I made this quilt top a year ago and with some quick quilting and binding it’s ready for use! It’s the third or fourth quilt I’ve made with my Road Trip Tutorial. The robot fabrics are by my friend Ariel. 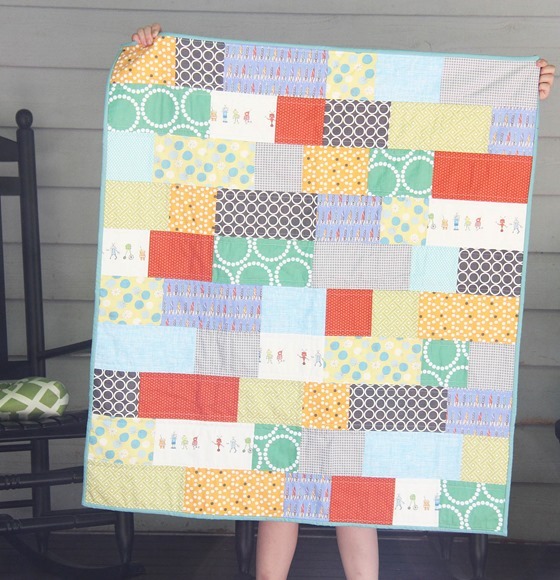 I love keeping little quilts like this for donating or gifting. Whales on the back don’t really go with robots on the front….but no little boy on the planet will care. very cute! thanks for all the inspiration you share! I'm loving The Old Reader too. I use Feedler on my mobile phone as a reader and it's compatible with The Old Reader. I prefer the Old Reader over the other options, but I read blogs on my phone about half the time so I went with Bloglovin instead. I don't love it, but it works. Cute! I have a quilt top made with this tutorial of yours waiting to be quilted. Maybe I should just finish it up for the next pregnant friend or coworker! Gorgeous quilt! The robots are too cute. 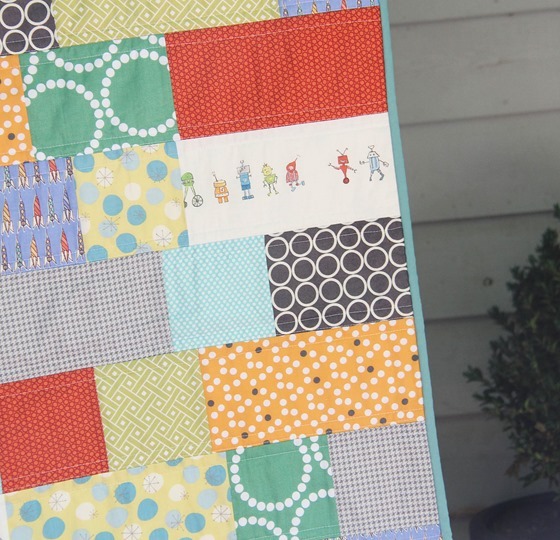 Cute quilt, I'll have to add it to my "TO Make" pile… I'm using Feedly as my reader, I liked it more than Blog Lovin. The app is also great. My bunny hangs out in my sewing room at night too! 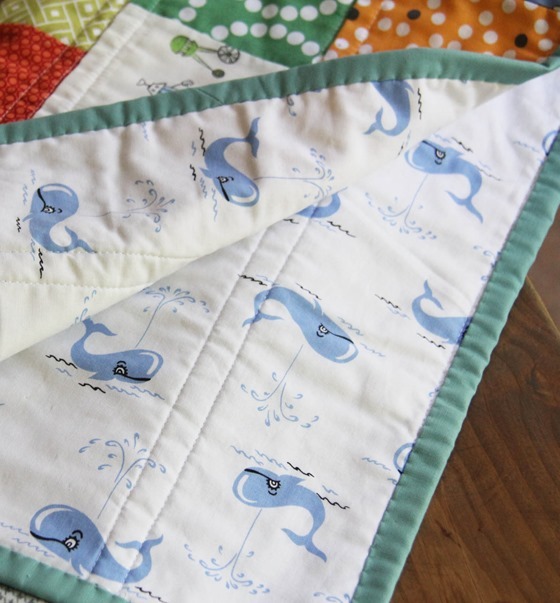 I adore the whale fabric! Love the quilt pattern too! Hi, any idea where I can find that cute whale fabric? Pebbles is adorable. I took a class with Jan Krenz once and managed most of a Lone Star with her help and book. I did have trouble at the center, and didn't worry about it much since all meting diamonds were the same color. Love those fabrics but I love Pebbles even more she is adorable. I so want a bunny (for my kids of course). ahh your rabbit looks just like mine.. :( [*] and I miss him so so much!!!! I love the Robot quilt. Thank you for sharing your idea. I want to make a Lonestar as well but after reading the instructions I'm not sure I'm up to the challenge LOL. But all those fantastic pictures may convince me yet! love your bunnie, so cute.. love to have a rabbit, but with a dog, chooks and guinea pigs there is enough animals for time being..
What is that cute whale fabric? I LOVE the robot fabric! Love your bunny! I miss mine; he passed away several months ago. Very cute quilt! Old reader is supported by my old iPad/iPhone app feeddlerRSS. It was nice… I am trying out another one and holding that in reserve with old reader. Is the binding hand stitched?? it's cool love the whales and robots. if it wasn't for rust whales and robots may be the best of friends..
My nearly 10yo daughter just woke up, peeked over my shoulder, and is ooing and ahhing over your Pebbles. Have a blast! Oh my Pebbles is adorable! Love all the projects too!